In honor of National Ice Cream Day this Sunday, Baxter will serve free “Like It” size (5 oz.) samples of D-backs Dugout Delight for fans to try from 11:30 a.m. – 1:30 p.m. this Friday at the Cold Stone Creamery location at the Arizona Center in downtown Phoenix. 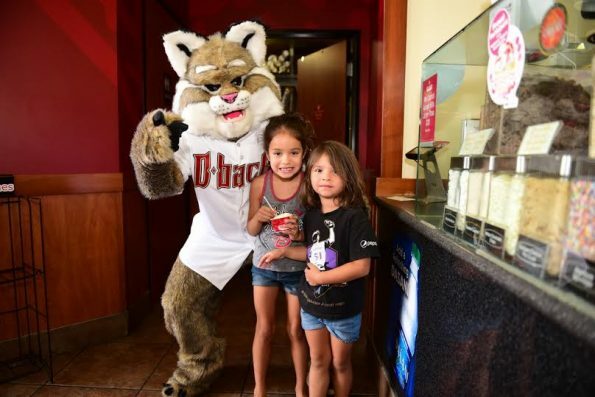 In addition to passing out ice cream to help celebrate Baxter’s birthday, Baxter will also invite fans to his birthday bash that will take place at the D-backs game this Sunday. The D-backs and Cold Stone Creamery teamed up in 2013 to launch D-backs Dugout Delight™, an ice cream Creation™ specially made just for the D-backs that features Cake Batter Ice Cream mixed with Butterfinger® pieces, Chocolate Chips and Fudge and is available at 44 Cold Stone Creamery locations across the state of Arizona as well as the Cold Stone Creamery stand at Chase Field. Baxter’s Birthday Bash, presented by PetSmart, on Sunday will feature a celebration alongside several local mascots at Chase Field. Baxter and friends will greet fans at the doors from 11:30-12:00 p.m. and will be introduced prior to first pitch. All mascots, including Baxter, will sign autographs in the 4th inning at Baxter’s Den in the Phoenix Children’s Hospital Sandlot. In addition, the first 5,000 kids on Sunday will receive a D-backs Back-To-School Backpack, courtesy of Smile Generation.